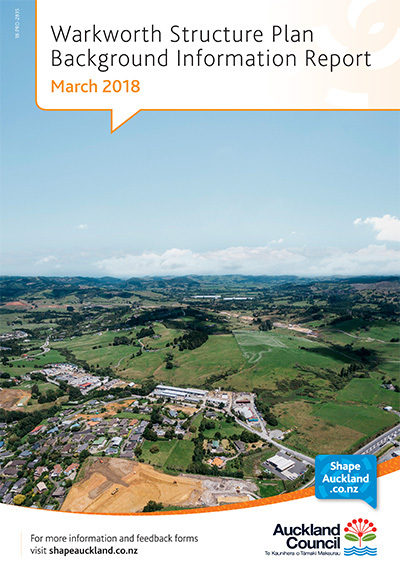 With the input of members, and other readers of the Mahurangi Magazine , Mahurangi Action has submitted feedback on the structure plan topic papers to Auckland Council. In order that the preparation of the feedback be totally transparent, an online pro forma was set up, which enabled anybody inclined to submit the content to Auckland Council at the push of a button—after providing name and email address, and making any changes or additions they desired, or had time for. Although it was not mandatory for the council to provide an opportunity for comment on the topic papers, nor was there much time for the community to respond—just 17 days from notificationfrom the officially emailed notification, but a newspaper notification was published on 28 March 2018 advising of the forthcoming opportunity to provide feedback from 3 April, and the council website had the information available from 3 April for those folk who thus knew to look for it to read, comprehend, and respond to 607 content pages and maps. How can the structure-plan process best integrate with a Warkworth centre plan? How can the structure-plan process best integrate with the 2017 Warkworth Community Aspirations document? How can the structure-plan process best integrate with the Mahurangi Action Plan: A Catchment Plan 2010–2030 ? Does the structure-plan process facilitate consideration of the growth needs of existing Warkworth industries? Was the topic-paper feedback period mandatory, and why were only 17 email-notified days allowed for feedback on more than 623 topic pages and maps? What happened to feedback provided in this phase that was not received by 5 pm 23 April? Will the topic-papers be amended to benefit from the feedback provided in this phase? What is happening now? Please say if the current feedback period is mandatory or otherwise, and what happens to feedback provided to this phase that is not received by 23 April? What will happen later? Please say whether the topic-papers will, potentially, be amended to benefit from the feedback provided during this phase. 5.2 Business Land Include demand for large-footprint industries such as those already established in Warkworth. 5.6 Environment Include recognition of the Mahurangi Action Plan: A Catchment Plan 2010–2030 . 5.8 Heritage and archaeology Include recognition of the site of the residence of Tudor Washington Collins. 5.9 Landscape Replace ‘Warkworth sits at the edge of the Mahurangi River, a northern reach of the Mahurangi Harbour’ with ‘Warkworth sits at the tidehead of the Mahurangi River, the main, northern reach of the Mahurangi Harbour’ or similar. The tidehead location, at the upstream limit of coastal navigation, is significant. escarpment and indigenous forest backdrop of the town to future development is greatly welcomed. Warkworth would be greatly diminished, if, as the report warns, new development peeked over the ridgeline behind the escarpment. 5.12 Parks and open space Acknowledge the strong community desire for the Mahurangi River to form the spine of a broad linear park, for multiple purposes. 5.13 Stormwater Acknowledge the elevated sediment accumulation rate of the Mahurangi Harbour, giving rise to the Mahurangi Action Plan. 5.14 Sustainability Further emphasise the opportunity for a denser urban form to be employed both to maximise public open space within the urban area, but also to allow rural land to be retained for other functions, including the large-footprint industries already successfully established in Warkworth. 5.15 Transport The assumption that park-and-ride is a sustainable transport model is flawed, particularly given Warkworth’s soon-to-be location on a motorway node. Models that go beyond park-and-ride, including ride-and-ride, walk-and-ride and bike-and-ride, need to be explored, if Warkworth is to be other than a same-old-same-old, unsustainable car-centric suburb. There is no mention in the background document of bikeshare and transit. 5.16 Urban design Recognition of the need for the structure plan to play its part in a design-led approach to development is welcome. The document should not resile from contrasting a design-led approach with the default, which is developer-led. 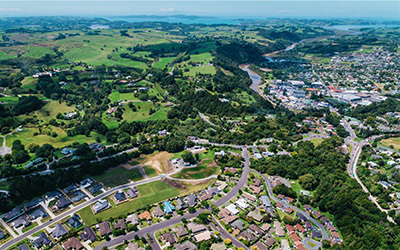 5.17 Water and wastewater With the end of the discharge of wastewater into the Mahurangi River, by the end of 2021, the vision of Warkworth as a swimmable town must a touchstone of the structure-plan process. 7 Conclusion Either the conclusion, or an executive summary, should note the community’s aspirations for Warkworth. Recognition of the need for the structure plan to play its part in a design-led approach to development is applauded. The topic paper should not resile from contrasting a design-led approach with the default, which is developer-led. It is axiomatic in designing a town for the 21st century that Warkworth be walkable and that the urban design be compact. However, Warkworth deserves to be much more than a walkable town, and the topic paper does not detail the location’s strengths, paramount of which is the Mahurangi River, and in particular its tidehead. In fact, the word river, much less the phrase Mahurangi River, does not appear once in this topic paper. 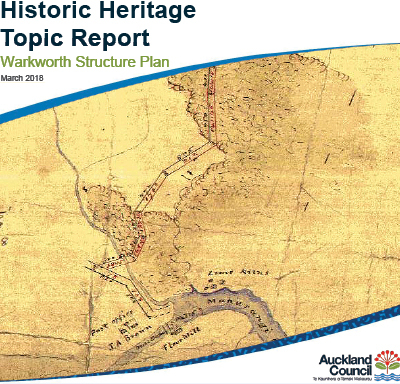 It is noted that the topic paper states that it is not an urban design analysis of the Warkworth area but is a precursor to it. That means, however, that in regard to urban design, unlike, for example, transport, no indication is given as to how the community’s aspirations for the town might be accommodated. It would be extremely useful for this topic paper to begin—or continue, if it were started by the revised background document—a discussion of potential visions for the structure plan, and that of the 2004 Rodney District Council plan, of a “village town focused on the river and contained by the hills” would be an apt and useful commencement point, with the word village, of course, reviewed. Historically, Warkworth’s tidehead location, at the upstream limit of coastal navigation, is significant. Natural weirs and limited river flow upstream of those weirs prevented useful navigation beyond the location, while the availability of reliably flowing water for powering mills recommended it for European settlement. Beyond that criticism, the landscape topic paper is encouragingly strong on recognition of the importance of the Mahurangi River. Particularly encouragingly is recognition by the paper of the sensitivity of Mahurangi River escarpment and indigenous forest backdrop of the town to future development. Warkworth would be greatly diminished, if, as the report warns, new development is allowed to peek over the ridgeline behind the escarpment. Consideration, in the topic paper, of other backdrops and skylines, such as the sublime ridgeline north of the Satellite Station Road valley is also extremely encouraging. The initial focus on sediment has been important as it has been identified as the primary issue facing the harbour. However, what [the sediment-centric action plan] needs is an overarching strategic context and integrative process within which the broader issues and activities occurring in the Mahurangi could be considered. Tourism and maritime industries will form a much greater part of Warkworth’s development, including in the study area. This last point, serendipitously, provides the perfect segue to the other major omission of the land-use topic paper. The only significant contemporary awareness, internationally, of Warkworth, is as the home of the preeminent America’s Cup boatbuilder, Core Builders Composites. The back story of how Warkworth became New Zealand’s first manufacturer of Portland cement, and subsequently how a modern master of concrete tilt-slab construction contributed to the building of New Zealand’s largest print halls, only for them to almost immediately become redundant and the perfect home for Larry Ellison’s boatbuilder, all spiced by fierce rivalry between the pioneer cement maker and the newspaper owner, would provide the script for a movie and multiple sequels. Yet the significant of Warkworth’s precursor factory of the future is barely understood and uncelebrated. Regardless of whether contemporary composite tooling and manufacture can be accommodated within the study area, if it is to accommodate the employees of such ventures, Warkworth will need to other than a dormitory town for Auckland executives and wealthy retirees, and unaffordable for the young and motivated whose horizons and interests extend well beyond the motorcar, and its century. In summary then, the land-use topic paper addresses land use beyond the study area in the rural direction, but insufficiently, within the existing town. …outline of existing information and previous planning relevant to the business land demand issues in the Warkworth structure plan. What it is not, is community-engagement friendly. It is unnecessarily acronym-heavy, with the liberal use of likes of FUZ, MUZ and LIZ, the latter of which not even defined, although LHIZ (light and heavy industry [zone]) is. When search-and-replace will instantly transform jargon incomprehensible to lay people into English, there is no justification for written reports to be abbreviated. Further, only 20 of the paper’s 62 are searchable. Such considerations aside, a major impression is that the paper appears to be entirely backward looking, in assessing future business demand. Warkworth movers and shakers, meantime, are pleading for planning for the future, and the immediate future aspirations at that. As discussed in the Land Use topic-paper feedback above, a specific example of a business that Warkworth should turn itself inside out to retain, is the high-tech, large footprint composites tooling and manufacture that has placed Aotearoa at the forefront of high-performance boatbuilding internationally. Neither the background paper nor this education topic paper mentions the Mahurangi Technical Institute. Mahurangi as a high-tech campus is frequently discussed by community and business leaders, and therefore needs to be explored as part of the structure-plan process. While it is appreciated that the structure-plan process, ultimately, is about live-zoning land current zoned Future Urban, to robustly consider the community-facility needs of that area, a holistic approach is called for that considers the potential use of land and facilities outside the study area. Both the Old Masonic Hall and the Warkworth Town Hall have been refurbished, but both have considerable potential, with further development, to play a much great role providing facilities for the wider Mahurangi community. The Warkworth Town Hall, for example, could provide the northeastern home for the Rodney Local Board, and operate as a movie theatre with filling a classic-movies niche, serving the senior segment of the community, and young buffs of the genre alike. The Old Masonic Hall, meantime, could have its appallingly blank back wall replaced with a river-facing “reading room” café. Both these uses, coupled with walkability and local transit, would impact on the community-facility needs of the study area. In an extremely innovative structure-plan process, heritage architects could collaborate with urban designers to identify a Mahurangi “style” or vernacular, that while allowing for endless individuality of building design, could nevertheless provide pleasing cohesion to the overall town. In turn, its execution could be aided by the town’s composites proponents—Mahurangi playing to its heritage and contemporary strengths. Particularly given his rich contribution to Mahurangi’s photographic heritage, include recognition of the site of the residence of Tudor Washington Collins, and that of his Queen Street store. Mahurangi River as spine of broad linear park Acknowledge the strong community desire for the Mahurangi River to form the spine of a broad linear park, for multiple purposes. Neighbourhood plazas Explore how greater use of pocket parks as neighbourhood plazas might civilise urban areas and valuably supplement other forms of parks. Alternatives to park-and-ride The assumption that park-and-ride is a sustainable transport model is flawed, particularly given Warkworth’s function, from 2012 onward, as a motorway node. Models that go beyond park-and-ride, including ride-and-ride, walk-and-ride and bike-and-ride, must be explored, if Warkworth is to be other than a same-old-same-old, unsustainable car-centric suburb. There is no mention in the background document of bikeshare and transit. Civilising park-and-ride Vandalism of bike lockers at Akoranga and other bus stations reflects a failure to fully civilise public transit spaces. The newly-opened 23-bay Manukau Bus Station, with its civilised toilets and cafés, is a step in a healthier direction. Transit stations deserve to be places where busy people—as well as those with leisure time—meet with colleagues, friends and family, or clients. Reference to the Mahurangi Action Plan, and particularly to the threat that development within the study area poses to the already elevated sediment accumulation rate of the harbour, is noted with appreciation. In addition to the threat, however, there is great opportunity for the new Warkworth to be far more river-centric and a far better custodian of the river than is the existing town. The town was once river-centric to the extent that it relied upon it for transport. But that was an entirely pragmatic focus, and it was a period during which deforestation unleashed a sediment flux that is yet to culminate, and anthropogenic global warming is raising the stakes, in the form of more extreme, extreme rainfall events. The structure plan, first and foremost, must set the sediment-generation bar at its highest level. The opportunities, again as the topic paper notes, are many, but if they are to be developed, they will need strong community and council leadership to resist the path-of-least-resistance of developer-led design. As an example of the community’s determination to participate in this exploration of alternative to developer-led design, the 9 May Warkworth Town Hall Talk was provisionally titled Urban Density and a Walkable Warkworth, and the Structure Plan, by Mark Fraser of HLC (formerlyas submitted: previously Hobsonville land Company). Every opportunity must be taken emphasise the opportunity for a denser urban form to be employed both to maximise public open space within the urban area, but also to allow rural land to be retained for other functions, including the high-tech large-footprint industries already successfully established in Warkworth. Figure 2 of the Geotechnical and Coastal Hazards topic paper is labelled as demonstrating the distance between the Future Urban Zone and the mean high-water springs. The blue dashed line demarking the upstream extent of the mean high-water springs is shown to cross the Mahurangi River at point about 400 metres downstream from the council’s current wastewater outfall, when in fact the river is decidedly tidal for a further 1.3 kilometres upstream. In contrast with Figure 2, the Regional Land Elevation Maps published in conjunction with Preparing New Zealand for Rising Seas: Certainty and Uncertainty , Parliamentary Commissioner for the Environment, November 2015, show an appreciable band of land within 0.5 metres of mean high-water springs, upstream of about upstream limit indicated on the topic-paper map. The scenarios … are projections of sea-level rise up to the year 2100. This does not mean that the sea will stop rising at the end of the century—it will continue to rise for many centuries to come. Meantime, Dr James Hansen et al, in Ice Melt, Sea Level Rise and Superstorms: Evidence from Paleoclimate Data, Climate Modeling, and Modern Observations that 2°C Global Warming Could Be Dangerous , warn that sea level could rise 5 metres in the next 50 years. Such a rise would impact Baxter Street and compromise Queen Street, and, as Dr Wright warns, will not be stopping at 2100. Although the bulk of the study area is significantly more elevated, by about 25 metres, so much uncertainty surrounds the likely rate of sea-level rise that green-field planning arguably should be premised on the possibility of the ultimate sea level being realised, and be designed to be relocatable. While this might be perceived as overly cautious, it serendipitously coincides with the rapid embrace, worldwide, of factory-builtsubmitted unhyphenated accommodation that is inherently relocatable. …opportunities to promote enhanced environmental protection measures, such as riparian planting to stabilise any old fill areas and better sediment discharge controls due to modern practices in the design of stormwater management systems, for example, the use of rain gardens and stormwater treatment devices. The proximate issue, when Mahurangi Action was established in 1974, as Friends of the Mahurangi, was a wastewater treatment scheme seen by the community and Mahurangi Harbour oyster farmers as inappropriate because of its very limited capacity to absorb inflows augmented by extreme rainfall events. Submitters convinced the special water tribunal that the preferable option was a combined Warkworth and Mahurangi Peninsula treatment plant, but local body collusion exploited a loophole, and the Warkworth Town Council was allowed to to proceed with what it fondly imagined would be a less costly option. The less-costly proved to be otherwise, and the Mahurangi River was relegated to the role of wastewater treatment plant “buffer zone”. With the end of the discharge of wastewater into the Mahurangi River, by the end of 2021, the vision of Warkworth as a swimmable town must be a structure-plan process touchstone. The use of water sensitive design, integrated stormwater management and enhanced sediment and erosion controls is strongly supported. It is imperative that excellent stormwater management is designed and implemented in order to protect the current good water quality and high ecological values in the area. …modelling shows that over 34 of the 44 bridges and culverts within the greater Mahurangi River catchment do not meet Auckland Council level of service, and are too small to pass the 10 year event without surcharging. Only three locations have been identified as requiring upgrade, however consideration should be given to further upgrades, so that assets are able to cope with development of future urban areas in order to prevent flooding events. The transition to urban land use can significantly increase sediment loading through site development (e.g. earthworks) if appropriate sediment controls are not implemented, monitored and maintained. The resulting urban environment then shifts the focus from sediment pollution to other contaminants common in urban environments, for example, heavy metals, wastewater overflows. The ongoing support and implementation of the Mahurangi Action Plan (referenced in section 3.6.3) is encouraged. It is an important document in the future development of the area to ensure the water quality of the Mahurangi river and harbour is preserved. Stormwater mitigation should extend to the Mahurangi Harbour, with the overarching objective being to restore the headwaters of the Mahurangi so that the silt and contaminants that are captured in the Warkworth town basin can manageably and regularly be dredged and disposed of on land.